Live! 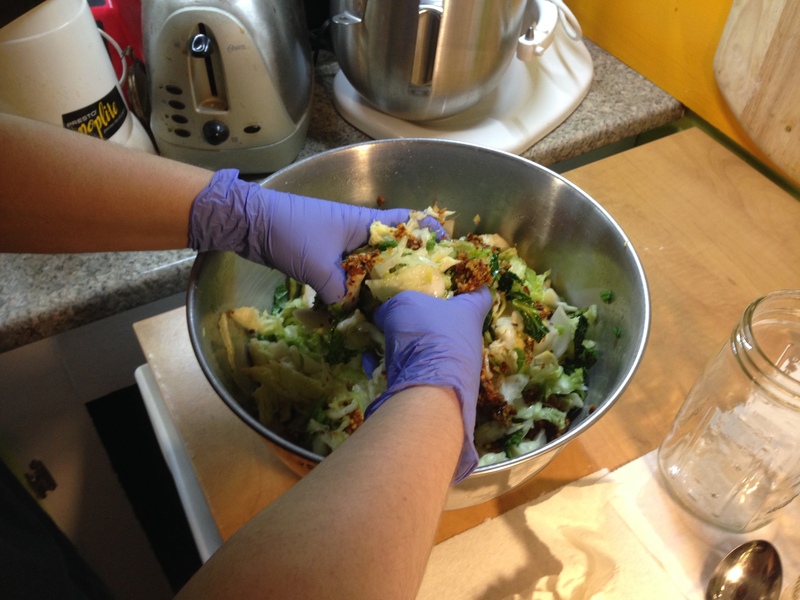 From the Stock Pot List: Kimchi (or Kimchee) | Food It Yourself! Anaerobic fermentation! No, that is not a spell from Harry Potter. It is a process by which glucose and other sugars are broken down in the absence of oxygen to produce lactate and other byproducts. This process goes on in your muscle cells when there is not enough oxygen to produce energy via glycolysis. The very same process turns milk into yogurt, cucumbers into half-sour pickles, and unassuming cabbages into sauerkraut and kimchi. The most observant of you probably already see where I am going with this. Kimchi (or kimchee, depending on who you ask) is an item on my Stock Pot List. This week I am checking it off. For a super convincing pro-home-fermentation read, check out this 2014 article from Food Safety News. It certainly bolstered my confidence, as did my purchase of some cool fermentation lids that fit onto wide-mouthed canning jars. I still had some trepidation about trying to ferment at home, though. What if my food was colonized by the wrong kind of bacteria? Food poisoning, particularly from anaerobic bacteria, can be very serious. I also have this totally irrational fear of my food being alive. Even though I love bread like nothing else I feel a little guilty when I put it in the oven knowing the living yeast beasts will die a hot death for my morning toast. I get a little freaked out when I eat a carrot that is sprouting. But enough about my neuroses, on to a DIY delicacy! After browsing what seemed like a zillion recipes for kimchi, and kimchee, I discovered two things. Firstly, there is no one thing called “kimchi” (or kimchee). The base is usually cabbage, but all kinds of things can be added to it- carrot, daikon radish and green onion were the most popular additions I saw. However, some recipes called for apples, pears, even melon rind. (You know I like melon rind. )I also noticed in reading the comments sections for these recipes that people who ferment vegetables are much more comfortable playing around than other food preservationists. Swapping soy sauce in for fish sauce? They said it worked fine. Left out the radish? Not a problem. It seems as long as the preparation is correct the product will be just fine. I eventually settled on this recipe from Fearless Eating. I was a bit apprehensive due to the vague measurements. Again, it seems like the instructions are more important than the ingredients. One thing that is absolutely the same between the kind of canning I am used to and fermentation is this: keeping everything clean is of highest importance. Clean everything. If you have any doubt, then clean it again. Do not forget to keep your hands very clean. Do not let the cat lick anything. (Maybe that is only a problem in my house, though.) Enough of me preaching about cleanliness- to the kitchen! 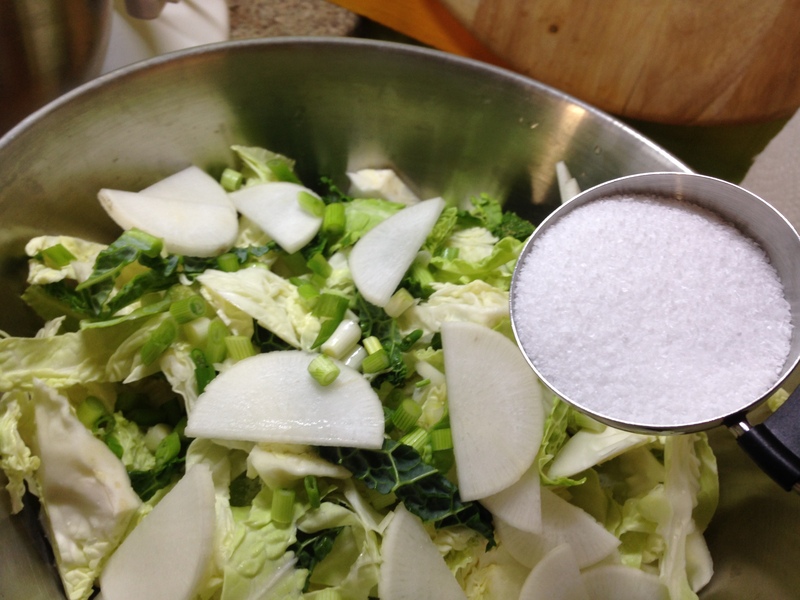 I layered the ingredients in the bowl, then massaged the salt in with gloved hands. I could see everything wilting within minutes, which is exactly what is supposed to happen. While the veggies were wilting I busted out the bullet blender and whizzed the garlic, ginger, pepper flakes, and fish sauce. The smell alone cleared out my sinuses. I sneezed a lot. Then I cleaned up the counter and my hands. CLEAN MATTERS. 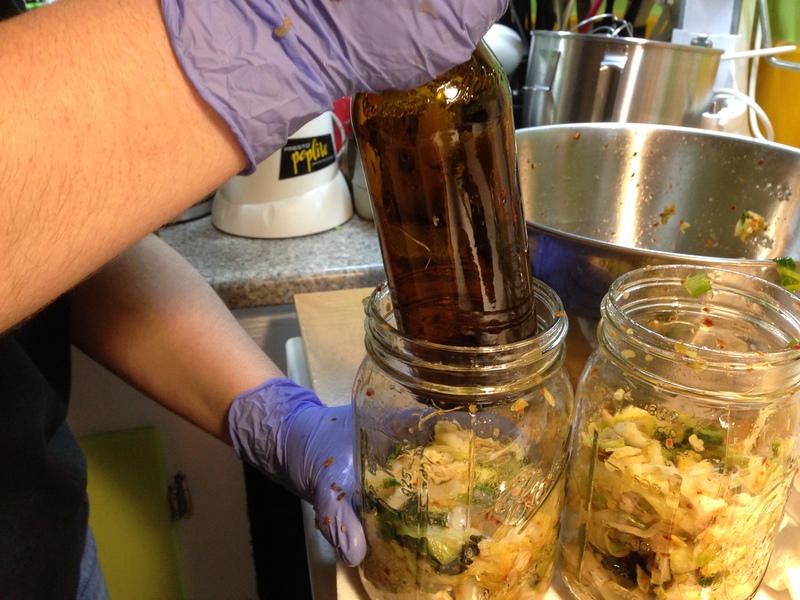 Also during the wilt of the cabbage I cleaned the jars and fermentation lids. The “special” lids I bought were easy to clean, which was a big deal for me. I washed them, and three quart sized wide mouth canning jars, in hot soapy water. 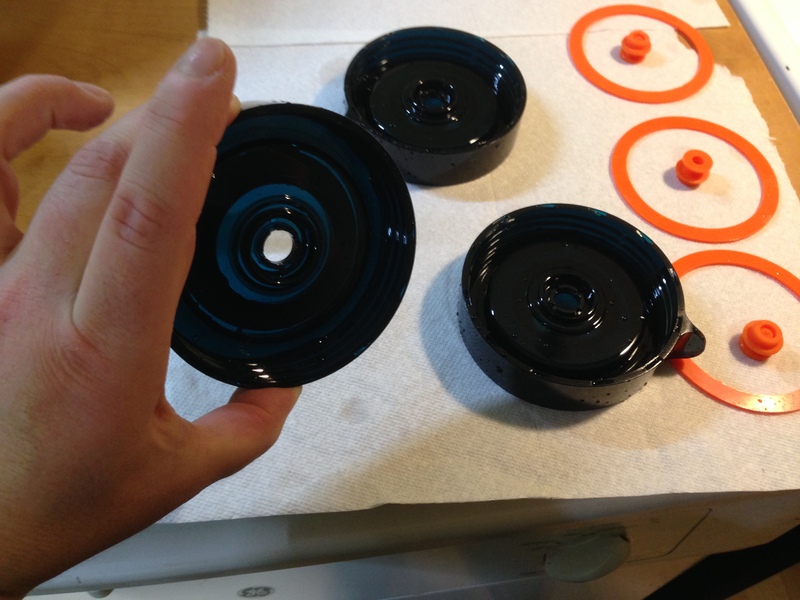 I took the gasket mechanism on the jars apart to get them extra clean. If you buy any sort of fermentation gadget make sure it is easy to clean. CLEAN MATTERS. Crushing the vegetables to remove air pockets is a critical step. You can spend serious cash for an ethically harvested, hand turned, avocado wood vegetable smoosher. I discovered, though, I could buy them six at a time for a reasonable price at the packy down the street. And I got six servings of Porch Rocker to boot. 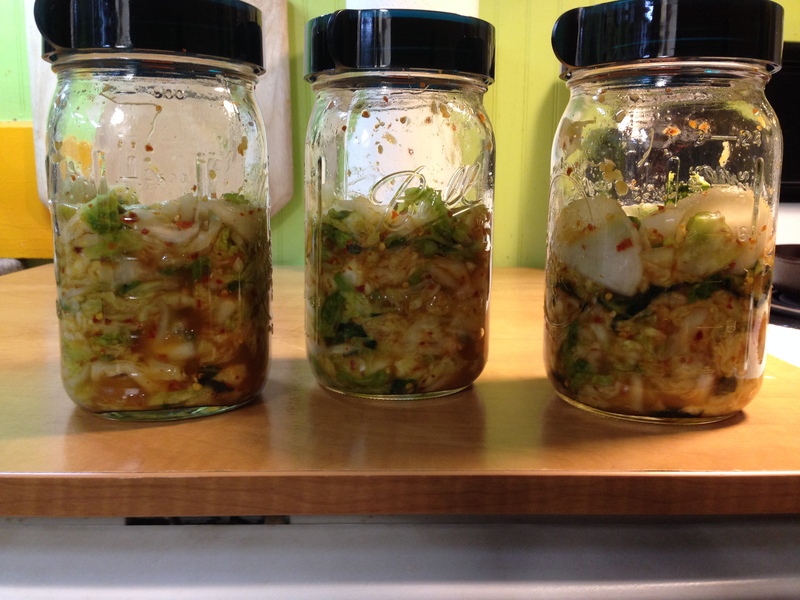 Here are my three jars of kimchi/kimchee. The fermentation lids came with a vacuum pump to ensure an anaerobic environment. I have done all I can. The rest is up to you, Lactobacilli. We won’t know if we have a successful batch of kimchi (or kimchee) for a few days, maybe a week. Maybe longer if it stays unseasonably chilly here in the Bay State. In any case it is safe to say that something is happening in three of the jars in my pantry. 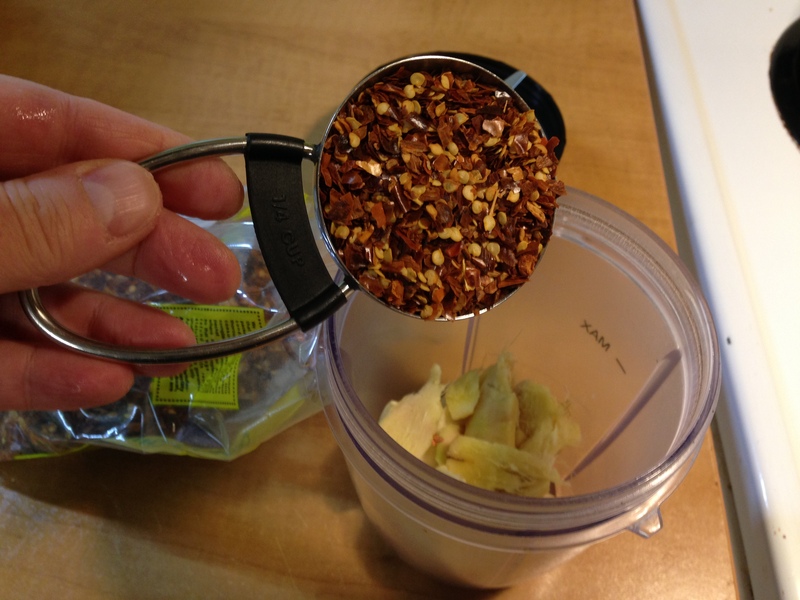 I still have a bit of unease with the casualness of the recipe, but I was quite particular with the method. I do not always leave my comfort zone. When I do it is frequently through food. What is the biggest step outside of your comfort zone you have ever taken in the name of your DIYet? Share in the comments section! Pingback: Kimchee (or Kimchi): It Grows On You | Food It Yourself!